Apologies if this has been posted already. Can't seem to find any other posts. 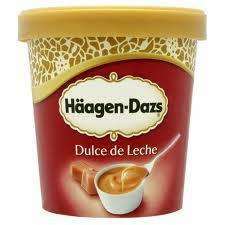 Haagen Dazs 500ml Dulce de Leche ice cream now only £1 in ASDA. Bought this in ASDA Wigan today. Was previously £2 a few weeks back. Seems a good price to me. The minis are rolled back to £1 online perhaps this is a misprice? Also was the case a fortnight ago, might of ordered too much! £1, I went mad for these when they were £2. Insanely good price but I really shouldn't. Ridiculous name...Leche is milk in spanish. ...And dulce is sweet...after a google translate...what is it with companies these days. This should help you out, Robo. My Argie mate loves the stuff. ...And dulce is sweet...after a google translate...what is it with … ...And dulce is sweet...after a google translate...what is it with companies these days. Literal translations don't always work out quite the same in any language, that's not really the company's doing Dulce de leche is what they call caramel sauce in South America where they happen to speak Spanish so not really all that ridiculous considering it's caramel flavoured ice cream .. Lets hope the heat doesn't melt the ice cream! £4 in bristol can anyone else confirm if this is not store specific? I saw it for £1.50 a few weeks ago in the Manchester, Trafford store. My Asda had them for £1.00 today. Bought 2, yum! Nice price but I'd still rather buy a 2L tub of Tesco's own for 70p. Dulce de leche is a caramel sauce made by boiling condensed milk in the tin until the sugars caramelise, hence the name translating to something akin to 'sweet milk'. Dulce de leche is a caramel sauce made by boiling condensed milk in the … Dulce de leche is a caramel sauce made by boiling condensed milk in the tin until the sugars caramelise, hence the name translating to something akin to 'sweet milk'.The More you Know!!! It is usually made by cooking condensed milk, inside the tin in boiling water. It then becomes like a delicious soft toffee when you open the tin and can be eaten on its own or as a topping. My grandmother used to make it for us all the time in Spain. Actually Dulce de Leche is a popular Spanish/Mexican dessert which has … Actually Dulce de Leche is a popular Spanish/Mexican dessert which has been made by generations of mums for their kids :-)It is usually made by cooking condensed milk,And leeches inside the tin in boiling water. It then becomes like a delicious soft toffee when you open the tin and can be eaten on its own or as a topping. My grandmother used to make it for us all the time in Spain.